I stayed at South Park twice in a two week period and I will NEVER stay there again. A Walmart parking lot would be a much better place than here. Both times I was treated rudely by the groundskeepers and swore at twice by them! And, when I went to the office to ask for one more night they brought up my reservation on the office computer, then said..."Sorry, we are all booked up until next spring!" So I said, "Well, I guess I have to leave in the morning. ", to which the park manager said "Yup!" Well, at my next stop the very next night I was looking at my paperwork and realized that I had indeed already paid for that night...but they just let me go and still haven't refunded me for the extra night they charged me for. I have several friends that live there and have been told that since I left 3 1/2 weeks ago nobody has been in the site I was in both times. The park is very nice, laundry facilities are good and the swimming pool is awesome, but the RV spaces are so close and tight to back into, plus there are cars and trucks parked in the street that makes backing into the sites even more difficult since the sites are barely long enough for the RV's, let alone the tow vehicle. 30 amp plug was loose and had to use a padlock to hold my surge protector plug from falling out. Found out later that it is against park rules to padlock the power pole. Plus, the pool and laundry room closes at 8 pm...hardly enough time for travelers to take advantage of these amenities. It is almost like they really don't want RV'ers to stop there...only year round residents! We camped at South Park Mobile Home Park (55+ park) in a Fifth Wheel. Costco, King Soopers, Walmart and Target close by, as well as lots of restaurants and other stuff! We just spent three nights at Echo Canyon and had a great time! Our site had no shade trees, but was very large, although the neighbors on two sides were very close, and even though the site wasn't level, it only took a couple of extra minutes to get set up. We were not looking for swimming pools and hot tubs . . . just a nice place to spend a few days relaxing. The highway and the helicopter noise didn't bother me in the least. The WiFi was great for checking email, but not good for trying to stream movies, TV, or music. But really, I've never been to an RV park that can handle that kind of stuff on their WiFi. Next time we go to the Royal Gorge we will stay at Echo Canyon again! 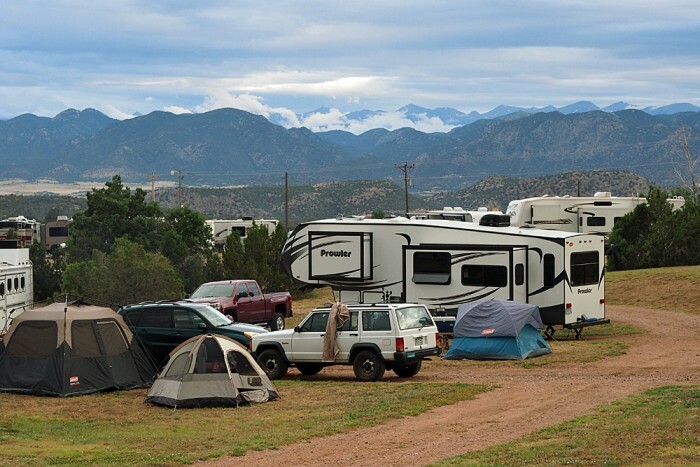 We camped at Echo Canyon Camping and RV Park (Formerly Park Fort Gorge RV Park & Ca in a Fifth Wheel. The gift shop/office doesn't have a lot of inventory, yet is very large and spacious. We probably would have spent some coin in there had they had more touristy Royal Gorge gift shop stuff for sale. We stayed here four nights and had a blast! The sites are back in, but I have been backing up trailers since I was 8 years old (now 55), so I didn't have any issues with that. Played mini golf and spent the day on Blue Mesa in a pontoon boat, then had dinner at Pappy's! We had to cancel our horseback riding as a rain storm came through. Instead, we drove back through Gunnison and up Taylor Canyon for some 4-wheelin'! The staff was great and helped us with whatever we needed. We did join the club and will be back there in three weeks for their last open weekend of this camping season! Can't wait! 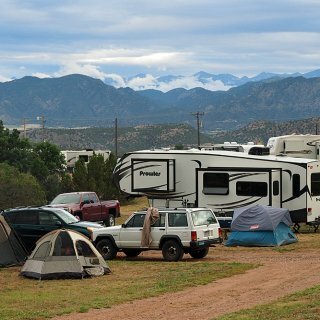 While we are not big into fishing (which is one of the big attractions to this area), we decided that we liked this location as a base for our summer camping activities as it is central to a lot of the places we like to go in the Colorado mountains. And when we have out-of-towners visiting, we can always take advantage of the cabins, some of which also have an RV spot right next to them. The wifi was OK (they said that they are working on it) and in the site we were in, we had no OTA TV reception, and since our trailer was new, this was the first time we ever tried to hook up cable TV to it. We couldn't get any cable TV stations, so I asked one of the park's maintenance guys about it, and he and another guy came out to our site and checked the post and even hooked a TV up to it, and as it turned out the cable hookup in our new trailer is bad (warranty repair coming soon). Hope they don't get tired of us as we plan on spending lots of time there in the near future and beyond! We love Blue Mesa Ranch! Wish I could post some photos here . 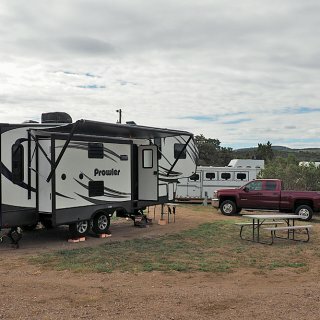 . . We camped at Blue Mesa Ranch in a Fifth Wheel. We have Verizon, so had spotty cell service at our site, but after all, this is a mountain getaway! But they have their 'cell service gazebo' by the parks entrance, and we got good service there. And Gunnison is only a 15 minute drive away for food, Walmart, gas . . . whatever you need! Very nice place to stay. Staff was great and this KOA has the best wifi we've ever had in a campground anywhere! Downside would be no cable TV (I'm a news junkie) and only two over the air stations (both PBS - although I learned a few things LOL). We enjoyed our stay there and will stay again next time we are in that area! We camped at Buena Vista KOA in a Fifth Wheel. We found this to be a very nice park. Wifi was acceptable, we didn't use the cable as the over the air TV channels were plentiful, and the sites were clean and level. Staff was great! The downside was that cattle ranch just down the road. It was a very rainy weekend and the smell was bad. Lots of birds and flies. We will stay here again when we need a last minute close by campground and all others are booked. 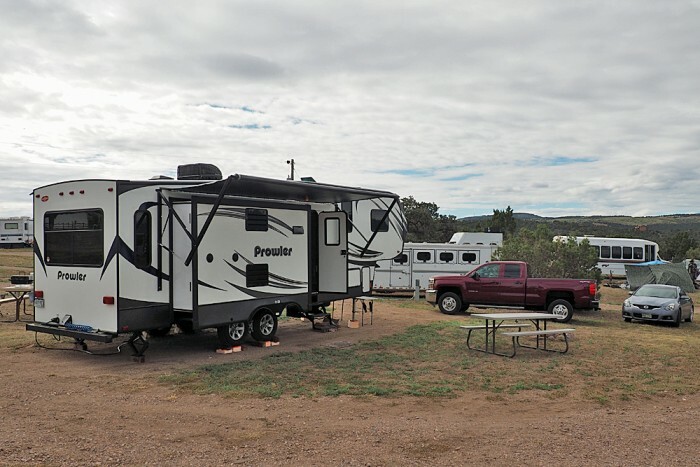 We camped at Fort Collins North / Wellington KOA in a Fifth Wheel.